"Everyone is friendly,” Diane says. “It’s just a nice community and it’s helped Mike and I a lot. We feel much healthier and just better overall." As a mother to four adult daughters, and a grandmother to three baby girls, Diane Marshall knows a thing or two about being a role model. She’s always worked hard in her career as a nurse and as a mother, but she hasn’t always been able to find the time to put herself first. 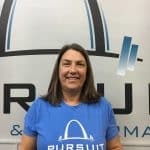 Her girls recognized this and decided to sign their mom up for a Mother’s Day special at Pursuit Fitness and Performance (PFP). “I knew I wanted to be stronger and do something for myself,” Diane says. This was in the spring of 2015, a few months before Diane’s eldest daughter, Katie’s wedding. “We had the wedding coming up, and that was motivation to get into shape,” Diane says. Months after Katie said, “I do” Diane realized she was hooked and decided to stick with PFP, continuing her workouts along with her husband, Mike. Favorite workout music: I like music from the ‘90s or pop/current music, which people find odd, but I think it comes from driving all the kids around for so many years. That’s what we always listened to. Go to healthy meal: Mike and I like to make steak fajitas from the Balanced Habits cookbook, but we use chicken instead and lots of bell peppers and onions. That’s one of our go to meals. Hobbies: I retired from nursing back in June and now every other month I go up to Chicago and help Katie with Olivia. I also like to hike, bike and read.